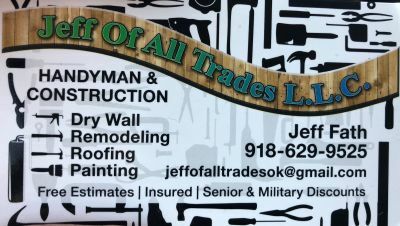 Jeff of All Trades is a Handyman & Construction contractor in Tulsa Oklahoma for remodeling, dry wall, roofing & painting. We offer free estimates and discount for seniors and military. Fully insured and bonded. Solutions for Small Problems -We can take care of small jobs such as repairing drywall, painting and other facelift projects to help polish your home or office. Recreate Your Space -Whether you need to update your kitchen or want to reconstruct your home’s layout, we can provide quality work to fit your budget. Inevitable Upkeep -Don’t worry about unexpected work such as wood rot, termites or fire damage get you down. We can restore your space to look new again. WE ARE PASSIONATE - We have a proven record of accomplishment and are a reputable company in the United States. We ensure that all projects are done with utmost professionalism using quality materials. HONEST AND DEPENDABLE - For us, honesty is the only policy and we strive to complete all projects with integrity and fairness, not just with our clients, but also our suppliers and subcontractors. WE ARE ALWAYS IMPROVING - We commit ourselves to complete all projects within the timeline set with our clients. We use the best of technology and tools to ensure that all jobs are done quickly but also giving attention to details and ensuring everything is done correctly.